Willem Dafoe digs deep for his portrayal of a troubled Vincent van Gogh, but the overall movie lacks heft. 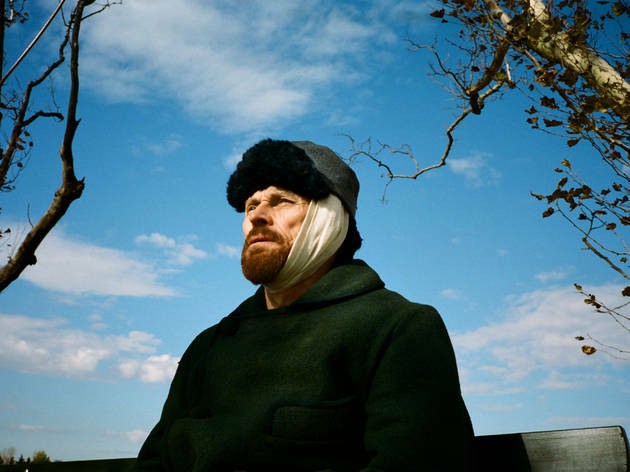 Uniquely personal yet undisciplined as a portrait of Vincent van Gogh’s final years, At Eternity’s Gate benefits from staying close to its subject, almost invasively so. A possessed and startlingly soft Willem Dafoe plays the painter—an unorthodox casting choice, since Dafoe is nearly three decades older than van Gogh was at the end of his life in 1890, dead at age 37 of a gunshot wound. Yet the actor’s pronounced wrinkles don’t unrealistically stick out. If anything, they resemble the stylistic severity of the artist’s self-portraits and hint at his taxing life. Experienced in capturing troubled creators with films like Basquiat and Before Night Falls, artist-turned-filmmaker Julian Schnabel viscerally absorbs the tortured groundbreaker. He also has his van Gogh (imagined via a screenplay by Schnabel, Louise Kugelberg and Jean-Claude Carrière) articulate the desire to make others see the world through his eyes, a modern longing that the artist Schnabel surely knows a thing about. Working with the French cinematographer Benoît Delhomme, Schnabel transposes van Gogh’s creative method onto a rich cinematic canvas of daffodils and starry nights. We first meet van Gogh at a grimy Parisian restaurant where his art show has just been prematurely cancelled, the unsophisticated customers frowning. On the advice of his artist friend Paul Gauguin (Oscar Isaac, suitably cool), Vincent trades the snootiness of Paris for the South of France, commencing a frighteningly prolific streak amid the vast landscapes of Arles while cooped up in an unkempt room. This is also where psychological struggles further haunt him, leading to the infamous ear-cutting incident which the film smartly refrains from showing us, in keeping with Schnabel’s anti-sensational instincts. That approach also results in the film feeling a bit basic: Simplistically hazy shots and jumbled dialogue represent the artist’s deteriorating mental health. While several well-sketched secondary characters break the film’s monotony—among them, Rupert Friend’s ever-supportive Theo (van Gogh’s brother) and Mathieu Amalric’s concerned doctor—the material seems half-considered, especially the painter’s time spent in an asylum, a productive span for all its pain. An incomplete exercise that lacks crucial emotional brushstrokes despite a rich palette and a piano-heavy score, At Eternity’s Gate still offers the thrill of being inside an artistic process, adoringly interpreted.